most churches no longer teach conviction and how professed faith must be put into daily practice. In marked contrast, Yahweh is uncompromising about how He expects His true people to worship as well as conduct themselves at all times no matter the circumstance or situation. The Bible is a record of how courageous believers overcame all kinds of difficult situations without yielding their principles. To know the mind and will of Almighty Yahweh we need only to look at what He commanded His chosen people. Malachi 3:6 and other passages tell us that Yahweh doesn’t change — His expectations are the same for us as for the patriarchs of old. Self-sacrifice is key to what Yahweh expected of all His people both anciently and now. Yet, today’s message is just the opposite: put yourself first. Aside from their regular offerings for sin, Israel’s worship included returning to Yahweh a tenth part of all their increase. This meant that a tenth of the best of the flock or field was to be given up as proof of one’s faith in Almighty Yahweh as Provider of everything. The principle of giving back through various sacrifices was at the core of the many offerings that Yahweh expected of Israel each day, and it remains a key part of New Testament worship. Today the tithe is intended to teach Yahweh’s people to revere Him first by returning to Him a small percentage of what most individuals hold dearest —their earnings. Deuteronomy 14:22-23 says, “You shall surely tithe all the produce from what you sow, which comes out of the field every year. And you shall eat in the presence of Yahweh your Elohim, at the place where He chooses to establish His name, the tithe of your grain, your new wine, your oil, and the firstborn of your herd and your flock, in order that you may learn to fear Yahweh your Elohim always.” Fear is the Hebrew ary and means to stand in awe of and revere. For the majority their pocketbook reflects their heart because it is what they revere most. Financial priorities tend to speak louder than anything else in our self-indulgent culture. Therefore, the question of whether to tithe becomes a key indicator of how much one is devoted to Yahweh. It answers the all-important and fundamental question: does He or do my own wants come first in my life? The First Commandments is clear — if we don’t put Yahweh above all else then our worship is in vain. He thunders in Exodus 20:3, “Thou shalt have no other Elohim before me.” Yahshua clearly understood this. He said in Matthew 6:21, “Where your treasure is, that is where your heart will be also.” Of the 29 parables Yahshua told, over half dealt with a person and his finances. Through these teachings Yahshua pinpointed what people value the highest. The parable of the rich man comes to mind. This individual described by Yahshua esteemed his riches more than he esteemed His Savior because He was unwilling to give up his wealth to follow Yahshua. By putting riches before Yahweh he proved that his gold is what he really worshiped. His gold was more important to him than his own salvation. How we give also demonstrates whether we love the brethren, which is another key element of True Worship. The tithe was used to support the priesthood, whose main job was to minister on behalf of the people. When we support the ministry today, which is the vehicle whereby Truth is spread and lives are changed, we are telling the truth seeker and the general body of Believers that we care about them and their salvation. This booklet will examine the meaning behind the tithe and the purpose for it, as well as what the tithe teaches us about True Worship. We will address common misunderstandings about the tithe, and we will see the great wisdom of Yahweh and His desire for us as manifest in His command to return 10 percent of our increase to Him. We first learn of the tithe in Genesis 14:20 when Abraham gives to the priest Melchizedek “tithes of all” his spoils of war. “Tithe” here comes from the Hebrew maasrah and means “a tenth part.” Later, the patriarch Jacob vows to return a tenth of all he owns to Yahweh, Genesis 28:22. Why did these righteous men of Yahweh willingly turn over a tenth of their gain or possessions to Him? Because they knew that it was essential to do so. The tithes of Abraham and Jacob demonstrate that these righteous men had a right worship concept firmly grounded in Scripture. Yahweh’s people know that the tithe is not theirs to keep or use. Yahweh said the tithe belongs to Him and is holy, Leviticus 27: 30. He warns that to keep it is to rob from Him. “Will a man rob Elohim? Yet you have robbed me. But you say, Wherein have we robbed you? In tithes and offerings,” Malachi 3:8. If we earn $100 then $10 is to be returned to Yahweh. If we keep that $10 we steal from Yahweh. Malachi’s warning is as clear as crystal. Furthermore, Paul cautioned that no thief will inherit the Kingdom, 1Corinthians 6:9-10. Giving over to Yahweh the firstfruit sacrifice was and still is fundamental to True Worship. The tithe is a firstfruits offering, the first 10 percent of our increase given before any of our own needs are met. Turning over the firstfruits to Yahweh is fundamental in both Old and New testament Scripture. This ancient principle extends all the way to Yahshua the Messiah Himself, who is a spiritual firstfruit offered by the Father on our behalf because of our sins. “But now Messiah is risen from the dead, and has become the Firstfruits of those who have fallen asleep,” 1Corinthians 15:20. Yahweh so loved us that He gave to us the first of His creation — His very beloved and only Son, John 3:16. What if He had decided to keep His Firstfruits —His Son — for Himself? In that case we would be lost in the death penalty earned by our sins! Can we give back any less than our own firstfruits to Him in joyful and humble appreciation? Every true child of Yahweh should have a compelling desire to tithe. That desire should be basic to worship. Proverbs 3:9 directs us to “honor Yahweh with your substance, and with the firstfruits of all your increase.” Firstfruits were offered to Yahweh in acknowledgment that everything ultimately belongs to Him and that all we possess is merely on loan to us. Those who revere Him will be blessed. Some spend their tithes on the poor. Yahweh commands, however, that His tenth be given to Him and used for the furtherance of His Truth, ministry, and teachings. It is the job of the ministry to determine where the greatest need is, just as it was with the priests at the temple. Malachi 3:10 commands, “Bring the whole tithe into the storehouse, that there may be food in my house. Test me in this, says Yahweh Almighty, and see if I will not throw open the floodgates of heaven and pour out so much blessing that you will not have room enough for it.” This also applies spiritually to the ultimate blessing of everlasting life! Israel willingly gave of the firstfruits of their crops, their livestock, their orchards and everything else they produced. These firstfruits were the best they had, given from “off the top,” not picked from the leftovers once their personal needs were met. Firstfruits are entirely Yahweh’s and are sacred to Him. No matter what is earned, increased, and gained from, the True Worshiper automatically returns a tenth to Yahweh. We are not to take our share first and give back the leftovers. We first return to Him His due — His 10 percent — and we then take care of ourselves. By this act we show Him that He comes before everything else in our lives. We must understand that paying tithes is not “giving” or offering to Yahweh anything. It is only rendering to Yahweh what already is His. Giving back only part of what belongs to Him is not tithing. If someone stole ten dollars from you and then gave you a dollar in return, you would consider the dollar a gift but at the same time you would consider the giver a thief. Similarly, if your tithe is ten dollars but you return only a dollar, then you are robbing Yahweh of His tenth. You may be returning some, but you are stealing the rest. A wife who is 85 percent faithful to her husband is not faithful at all. There is no such thing as partial tithing. Tithing is a compelling test of our true desire to serve Him by showing whether He indeed comes first in our lives. Putting Him last monetarily — after we have first taken care of ourselves — reveals a spiritual defect. It tells Him that I am more important than He is! If Idolatry means putting anything else before Him in worship, then non-tithing is idolatrous. The Feast days teach a fundamental principle here through the harvest firstfruits that Israel was to present to Almighty Yahweh on His special days. One Feast in particular, Pentecost or Feast of Firstfruits, is specifically about this firstfruits offering to Yahweh, where the first gatherings of the wheat harvest were presented to Yahweh and only then could the general harvest begin. In other words, once our obligations to Yahweh are met then we focus on our own needs. Yahweh judges what we give by what we keep. What we cherish reflects our heart’s true desire. The question of whether I should tithe or not boils down to a simple issue: do I recognize, honor, and serve Him above all else? Even above myself? If not, then I need to re-examine my attitude and get right with Him. Is the Tithe Only for Farmers? Let us re-read Leviticus 27:30, “And all the tithe of the land, whether of the seed of the land, or of the fruit of the tree, is Yahweh’s, it is holy unto Yahweh.” Some believe this means tithing applies only to farmers. This is not only irrational but also clearly inequitable. Are we to believe that only farmers are to fear and revere Yahweh? That just farmers alone are to put Him first in their lives? That only farmers are to receive instruction and practice on what is holy to Yahweh? That only farmers return what belongs to Yahweh while the rest of us are free to keep what isn’t ours? In truth, a tenth is required from all the riches and wealth that the earth produces to our benefit, no matter what it is and who earns it. As an agrarian people Israel derived their income from the land so naturally Yahweh would instruct that whatever the land produced they were to tithe of. Not everyone in Israel farmed, but everyone still tithed. Abraham gave a tenth of the spoils of war, Genesis 14:20, while Jacob gave a tenth of all he possessed, Genesis 28:22. The Levites as well had to give their 10 percent from the tithe given to them, Numbers 18:26-28. The Levites were priests, not farmers. They could not own land or produce anything. Their income was from a second-hand source — the people who came to the temple. Most giving in the Old Testament was to support the priests and the Levites in their duties, Numbers 18:24. The Priests and Levites were the clergy of the Old Testament. The Priests handled the sacrifices and were responsible for instructing the people in the Word of Yahweh (2Chron. 31:4, Mal. 2:6-9). The Levites led people in worship and assisted in the physical management of the tabernacle and temple (1Chron. 23:28-32). The issue is not where the tithe comes from but whether we prove our faithfulness by turning over to Yahweh a tenth of whatever is produced or profited from — no matter how we make our living. Yahweh does not need our adherence to any of His commands. But He does expect our willing obedience as a sign of our true hearts as His committed people. By this He knows who are indeed His. The word “land” that Israel was to tithe from in Leviticus 27:30 is far broader in scope than just agricultural fields. It is the Hebrew erets and includes “earth, whole earth, earth as opposed to heaven.” From erets we see that everything belongs to Yahweh, even our existence. Paul said in 1Corinthians 4:7, “What do you have that you did not receive? And if you received it, why do you boast as if it were not a gift?” (NRS). We leave everything behind when we enter the grave so that nothing is truly ours. Hearses do not pull U-Haul trailers. The gift of our life itself ultimately returns to Yahweh who gave it, Eccl. 12:7. If He wants to let us keep 90 percent and requires only 10 percent in return, who are we as His creation to argue? What is the clay that it should challenge the potter? What does it tell Him about us as His worshipers if we resist or refuse? Yahweh has the perfect right to demand everything from us, yet He asks for only a small percentage and then waits to see whether we revere Him enough to follow through. When we willingly obey He blesses us with more, Mal. 3:10-12. Tithers soon discover that 90 percent of their income after tithing will stretch further than 100 percent without tithing. Yahweh blesses the tither. Quibbling over whether or not to tithe exposes a heart problem. By keeping the tithe for ourselves we say to Yahweh that He isn’t even 10 percent important to us. Not only that, but that we think so little of Him that we would steal from Him! In marked contrast, a True Worshiper puts Yahweh above everything else. The person with Yahweh at heart will not keep what is not his but would joyfully give it ALL up if asked to do so — even if that means his very life. Rightly managing the tithe proves that we have a heart longing to obey. We see this principle in operation when Yahweh directs Abraham to offer up Isaac, the patriarch’s most valued possession. What Yahweh really wants is to see Abraham’s true heart revealed through his willingness to part with his son if it came down to it, just as Yahweh revealed His love for mankind by giving up His own Son for us. Abraham passes the test and thereby confirms his complete devotion to and love of Yahweh. True Worship always requires a measure of personal sacrifice. Our firstfruits — the tithe — is an essential way of proving our true love for Yahweh. Giving is part of love itself. We give to our spouse and children because we love them. Giving to Yahweh through His ministry here on earth reveals our love for Him and the brotherhood. “Elohim is not unjust; He will not forget your work and the love you have shown Him as you have helped His people and continue to help them,” Hebrews 6:10, NIV. In contrast, Ananias and Sapphira in Acts 5 held back for themselves a portion designated for the work of Yahweh and each swiftly suffered the ultimate punishment. Notice that Yahshua did NOT say, “Just worry about justice, mercy and faith and let the herbs take care of themselves,” or something equally dismissive. Rather, He confirmed the necessity of the tithe by directing them not to neglect it, either, as they refocused on what they had been disregarding. In another parable in Luke 18:12, Yahshua confirmed that proper tithing constitutes a tenth of our gain, regardless of how that gain is achieved. He never told the Pharisee or anyone else that tithing was no longer required. Some may say they could show their love better by giving whatever they wish instead of a set amount like 10 percent. The Bible shows that the tithe is just a starting point, a minimal amount expected of us. If one desires to give more, one is freely allowed to do so and will be blessed accordingly. Yahshua said in Luke 6:38, “Give, and it will be given to you. A good measure, pressed down, shaken together and running over, will be poured into your lap. For with the measure you use, it will be measured to you.” He put no limits on giving. Hebrews 13:16 says, “And do not forget to do good and to share with others, for with such sacrifices Elohim is well pleased,” NIV. There are actually three kinds of tithe in Scripture: the first is a tenth of all increase by wages or profit, Leviticus 27:30-33; the second tithe is used personally for attending the Feasts, Deuteronomy 14:22-27, and the third comes around every three years and is for the stranger, widows and orphans, Deuteronomy 14:28-29 and 26:12. All of these tithes carry with them a promise of blessing if we do them, Deuteronomy 14:29. Since the Garden of Eden man has been trying to do things his own way — instead of the way Yahweh prescribed — and man’s way nearly always leads to problems. Yahweh showed us through Old Testament Law that tithing was part of what He considers acceptable worship. He never said otherwise in the New Testament. Some contend that because we are not under the Levitical priesthood that tithing is brought to an end in the New Testament. It is true that we are now under the Melchizedek priesthood with Yahshua as our High Priest in the Melchizedek order, Psalm 110:4. But as shown in the account of Abraham, the Melchizedek priesthood also took tithes. It was to Melchizedek the High Priest that Abraham returned a tenth of the spoils of war, Hebrews 7:1-2. Yahweh’s desire is that His ministry under today’s Melchizedek priestly system have a means of support to carry out the work of preaching and teaching, in the same way that the Levitical system was supported by tithes. Paul instructed Timothy, “The elders who rule well are to be considered worthy of double honor, especially those who work hard at preaching and teaching. For the Scripture says, ‘You shall not muzzle the ox while he is threshing,’ and ‘The laborer is worthy of his wages,’” 1Timothy 5:17-18. Paul was a tentmaker, Acts 18:3. But he did not rely exclusively on his vocation. The brethren in Philippi sent him aid when he was out ministering (Phil. 4:16), which he accepted. Paul explained that those who minister have a right by authority of Yahweh to expect support: “Yahweh has commanded that those who preach the evangel should receive their living from the evangel” (1Cor. 9:13-14). The Apostle Paul personally chose not to live solely by proceeds from ministry, even though it was lawful for him to do so. Paying the tithe is our obligation, and our attitude toward it is as important as the act of doing it. Yahshua looked for examples where righteous people showed their generosity of spirit regardless of their own personal needs or situations. One of Yahshua’s key examples leaves us all without excuse when it comes to giving. Yahshua was not impressed with the large amounts that the rich contributed to the temple treasury. And although the wealthy did give, “they all gave out of their wealth” (Mark 12:44). What won Yahshua’s praise and His heart was the sacrificial giving of a poor widow who couldn’t afford to give by anyone’s standard and yet she still gave — of the very money she needed to survive on! What dedication! What faith! Her true heart was revealed as she put Yahweh before even her own basic need for food and shelter. As you read this account, notice that Yahshua did not excuse her from giving because she was poor. He recognized that giving is an essential part of worship that teaches us to subjugate self while reaching out in love to others. This is a critical lesson for the True Worshiper: if you don’t sacrifice then how can you truly serve Yahweh? “And Yahshua sat over against the treasury, and beheld how the people cast money into the treasury: and many that were rich cast in much. And there came a certain poor widow, and she threw in two mites, which make a farthing. And he called unto him his disciples, and said unto them, Verily I say unto you, That this poor widow has cast more in than all they which have cast into the treasury: For all they did cast in of their abundance; but she of her want did cast in all that she had, even all her living,” Mark 12:41-44. The act of giving is just as much a part of True Worship as keeping the Sabbath and calling on Yahweh’s Name. The tithe is like loving a wonderful spouse. It is a token reminder of how important he or she is, but at the same time shows that they deserve much more than it would be possible to give. If you think you can’t afford to tithe, examine your budget and expenses each month to determine what you can do without so you can tithe. 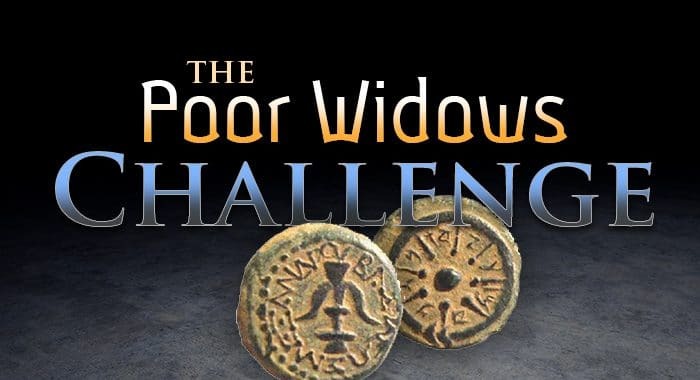 The lesson of the widow proves that no one has an excuse. And if someone claims he cannot tithe but yet owns a cellular phone, cable television, a boat, a sizable savings account, or any of life’s non-essentials, that person needs to re-evaluate priorities and begin putting Yahweh first. Yahweh was touched, and so He gave that man money, time, and a glorious talent. And then Yahweh waited…and waited…and waited. Weary of waiting, He shrugged His shoulders and took all those things back from the man — the money, the time and the glorious talent. Eventually the man said, “If I only had some of that money back, I’d give it to Yahweh. If I only had some of that time, I’d give it to Yahweh. If I could only rediscover that glorious talent, I’d give it to Yahweh.” And Yahweh sighed in deep disappointment. Good intentions are worthless unless we put legs on those intentions, carry out our obligations and fulfill our promises. When we make a commitment to Yahweh, that commitment is binding and unchangeable. Our promise to be faithful to Him in ALL things was permanently and irrevocably set when we repented and were immersed into the Body of Messiah. We vowed to change our lives and obediently do all that He commanded us in His Word. Vows are irreversible, Ecclesiastes 5:4-6. “Whoever sows sparingly will also reap sparingly, and whoever sows generously will also reap generously. Each man should give what he has decided in his heart to give, not reluctantly or under compulsion, for Elohim loves a cheerful giver,” 2 Corinthians 9:6-13. May we live up to our promises and receive the blessings that come with being good stewards of what He gives us. Posted in Biblical Law and Torah Studies. The Bible describes the tithe as 10% of our increase, including livestock (Lev. 27:32), produce (Lev. 27:30), monetary wealth (Mark 12:42), and war plunder (Gen. 14:18-20). While many believe tithing is limited to livestock and produce, it’s more than these items and includes any increase. In our modern age, we pay tithes based on our earnings. In essence, this no different from a farmer working and receiving earnings based on his crops.